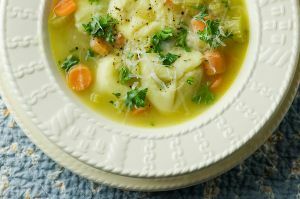 Chicken Tortellini Soup is from chicken recipes is cooked with carrots and broccoli. Cook chicken in small amount of oil. While meat cooks, chop vegetables and open cans. Add all of the above ingredients to large kettle except for the tortellini and frozen broccoli. Simmer for an hour then add tortellini and broccoli in the last 10 minutes or so before serving so that they are not over cooked. Soup tastes great with freshly grated Italian cheese and a loaf of Italian or French bread.